Fredericksburg (exit 130): Best Western. Clean, by shopping and food. Emporia (exit 11): Holiday Inn Express. One of our regulars stays at this hotel and says very good things about it. Emporia (exit 11): Quality Inn. Basic Room, Clean, Rooms have microwave and fridge, Shoney's is across the parking lot to get a bite to eat. Roanoke Rapids (exit 171): Hilton Garden Inn. 111 Carolina Crossroads Parkway. Pet friendly. Rocky Mount (exit 138): Comfort Inn. 200 Gateway Blvd. Pet friendly. Fayetteville (exit 49): Holiday Inn. Have only a few rooms reserved for pets, but they are extremely clean with a fridge and microwave. Restaurant on-site with room service too. Must make reservations way in advance, since pet rooms are limited. Fayetteville (exit 49): Sleep Inn. Very clean; Large dog fields..
Fayetteville (exit 49): Comfort Inn. AVOID Hotel looked nice in ads. They never mentioned they had separate pet friendly rooms until arrival. Room was moldy, damp and unkempt and bed linens had a terrible odor. 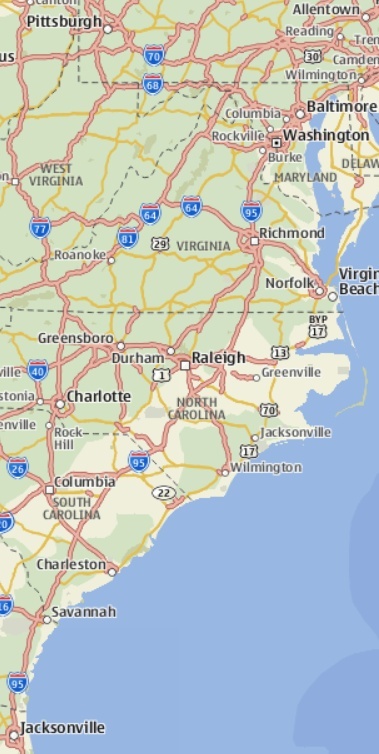 Charlotte: From a guest: "I highly recommend the La Quinta in Charlotte, right off 77S. I think everyone that checked in had a dog." GA: Brunswick (GA exit 36): Clarion Inn. Clean, Basic Room, right off I-95, right by food and shopping. Note : This one just changed management in June 2008 and is no longer part of the Clarion chain, but they continue to use the name. Stayed last year and they were still clean and accommodating. GA: Brunswick (GA exit 36): Best Western Clean, basic Room. Separate restaurant on site – shares parking lot - that is not associated with the hotel, but good food.